It is I, Michael. I am taking an opportunity to impart upon you some of my impeccable taste and epicurean prowess. Normally my girlfriend Kayle, aka "The Cooking Actress", would give you a witty anecdote, some pretty pictures, and a fairly detailed recipe. Today, however, good peoples of the blogiverse, I will be at the helm of this expedition and we will be taking a road-less-traveled for some of you (Kayle included) by focusing on an efficient and literally zero mess method (if done correctly) for filling our hungry-hungry-hippo selves. I bring to you today a fine delicacy from a can. I bring to you, SpaghettiOs. Now you may be thinking, "What!? I know how to make that! pour the can into a bowl and heat it up." Oh no my doe-eyed blogateers! The secret is far simpler than that! We will get to the end goal of satisfaction without all those pesky steps and minutes of waiting. TO THE "RECIPE"! Truly this is a 2 step process with more detailed sub-steps if you will. 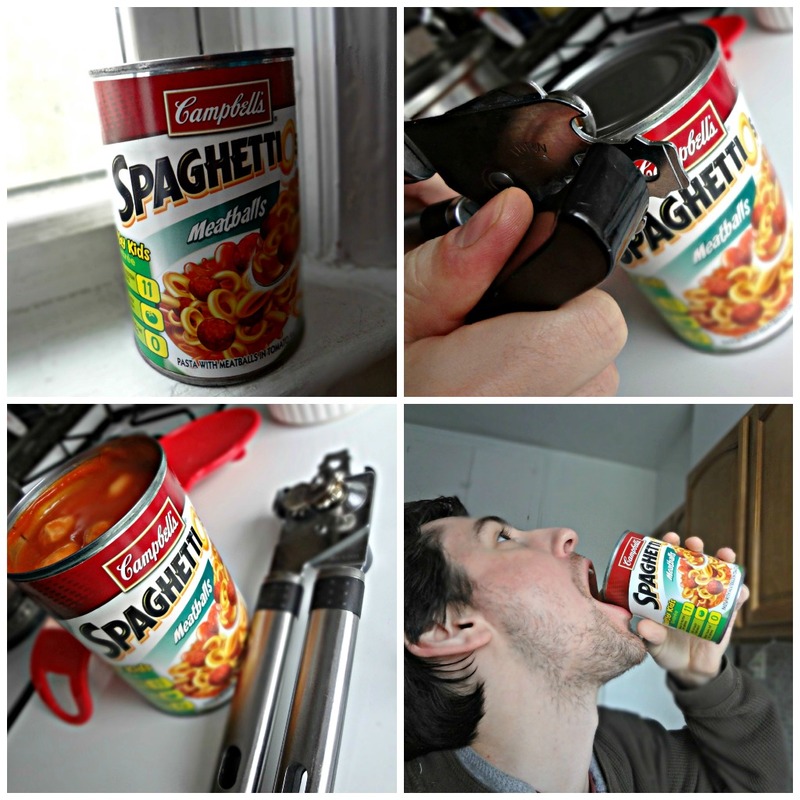 Take a can opener and open the can of SpaghettiOs. -I personally prefer SpaghettiOs with "meatballs" which can make this a tad trickier, but be not afraid my brood of blogchilds, I am an expert at this. -The trick here is to open the top of the can and position it above ones gaping maw. -You may notice here that the congealed mass does not seem to be in as much of a rush as you clearly are at this point, merely trickling into your mouth or quite rudely not moving at all, making you look like a large odd looking baby bird waiting to be fed. There is a solution to this! -Much like the classy concept of shotgunning a beer, we must break the vacuum death grip the evil can has on our delicious ambrosia. What you do is take your can opener and puncture the bottom of the can as if you were going to open up the bottom of the can, but only just enough to break the seal. -That's right! No dirtying a bowl or spoon. No waiting for it to heat up in the microwave. Open that bad boy up and chug down delicious cold SpaghettiOs. So there you have it my cadre of blogatrons. No dirty dishes, no waiting, just recycle the can when it's empty and you've just enjoyed a world class meal in the matter of a minute and a half! Now you have more time to pwn n00bs, perfect your army of robot-lizard warriors, perfect your band's style, teach koalas to play polo, and generally be the stylish and sophisticated man/woman-about-town that you are. It has been my pleasure to take this little trip with you my intrepid bloginators. I shall remember my time with you for at least 3 and a half weeks. Until next we meet, may the force be with you, the grace of the Valar be with you, and have fun storming the castle.